Need a lightweight outdoor stove for backpacking, hunting, or camping? 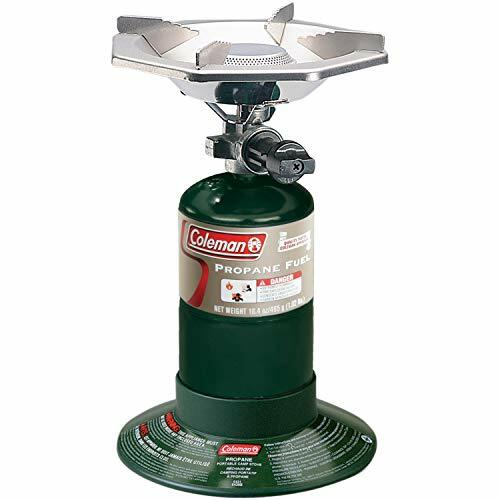 Look no further than the Coleman Portable Bottle-Top Propane Stove, which fits up to an 8-inch pan above a fully adjustable burner for precise temperature control and up to 10,000 BTUs of cooking power. Brew coffee, heat up hot dogs, and so on, knowing you can enjoy up to 2.5 hours of cooking on just one 16.4 oz. propane cylinder (sold separately). PerfectFlow technology keeps that heat steady, even in extreme conditions, and a large base offers stability for easy stirring. When it’s time to break down the campsite and fit all your gear into a crowded pack, you’ll be relieved to know that the burner and base separate from the propane cylinder for truly compact packing. Rest assured your ultra-portable stove comes with a 3-year limited warranty. The Coleman 5431A700 One-burner Propane Stove is an easy-to-use portable stove that should meet almost any camp cooking need. The PerfectFlow regulator provides consistent cooking performance by producing a steady fuel stream, even in cold weather, high altitudes, or when fuel is low. Equipped with one 10,000 BTU burner, this fully adjustable stove will last for 2.2 hours on high or up to nine hours on low. The pot supports help shield your cooking flame from the wind, while the large eight-inch burner bowl should fit most any pot. This Coleman one-burner stove can boil a quart of water in just four minutes! This stove operates on one 16.4-ounce cylinder of Coleman propane (not included).